Chelsea striker, Diego Costa will contest the Football Association’s charge of violent conduct leveled against him over an alleged stamp on Liverpool’s Emre Can. The 26-year-old is being charged for the first two alleged stamps that passed unnoticed by referee Michael Oliver, the latter on central defender Martin Skrtel, which left the Slovak in a heap. The first half incident involving Can took place close to the technical area and prompted a clash between the forward and the Liverpool midfielder. 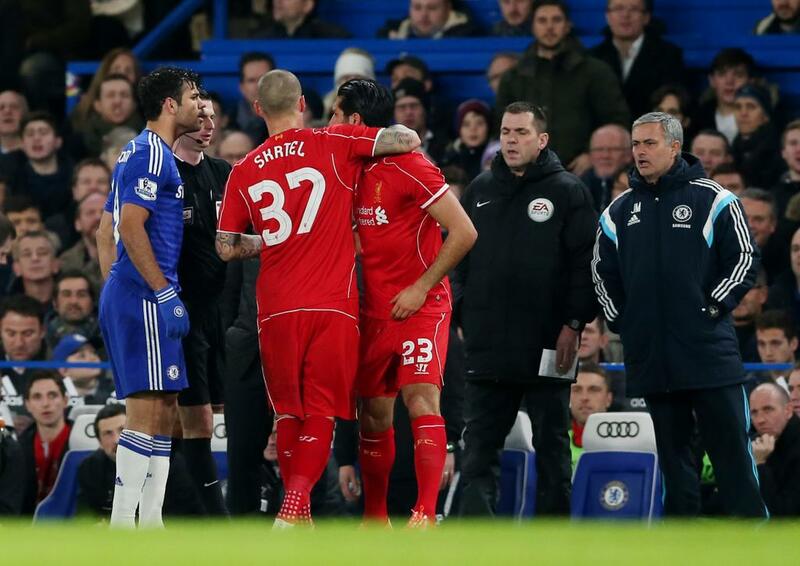 Diego Costa Charged By FA after Clashing With Emre Can in a League Cup Game. Image: Getty. The FA will review video evidence, and pass their verdict on Friday. The Spain international faces a three-game ban if found guilty, and could miss Chelsea’s game at home to Manchester City on Sunday. He could also miss next month’s game at Aston Villa and the clash with Everton at home. Chelsea won the Capital One Cup second leg tie 1-0 to round off a 2-1 aggregate win and will face Tottenham in the final at Wembley on March 1. Eto’O Apparently Injured as Finke Refuses to Confirm His Cameroon Retirement. Ronaldo Faces Messi Tonight, Who’ll Win Ballon d’Or?